Favorite Tough Mudder obstacle would be King of the Swingers. 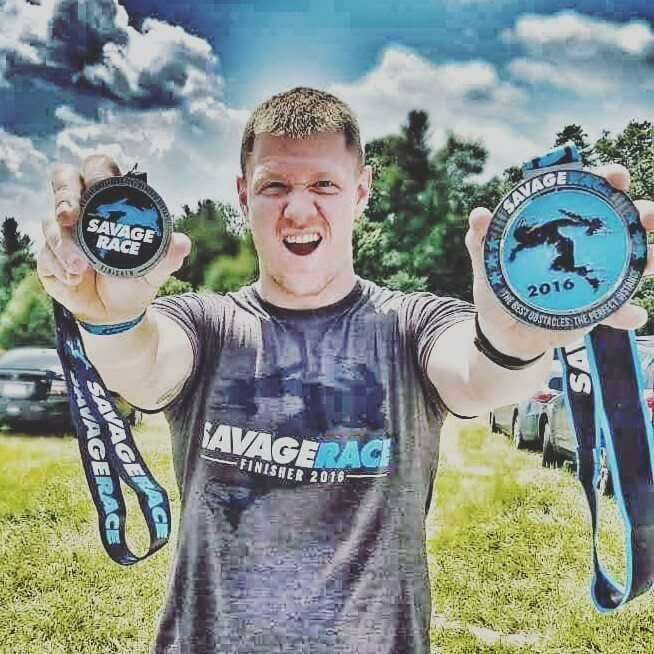 Favorite non-Tough Mudder obstacle would be Savage Race’s Wheel World. My least favorite obstacle by far is Pyramid Scheme. My main goal for the remainder of this year is to withstand all 24 hours of the World’s Toughest Mudder (my first) and get to 50 miles. I am a pretty easy going, laid back guy. I truly believe in living life to the fullest and doing something everyday that will make you better than you were yesterday. I grew up very active in sports and played a little over a year of college football. OCR gives me that opportunity to still feel competitive. OCR also allows me to push myself further than I have in any sport I have ever played and I love pushing myself to see how far I can truly go. strive to become so much more than I currently am. 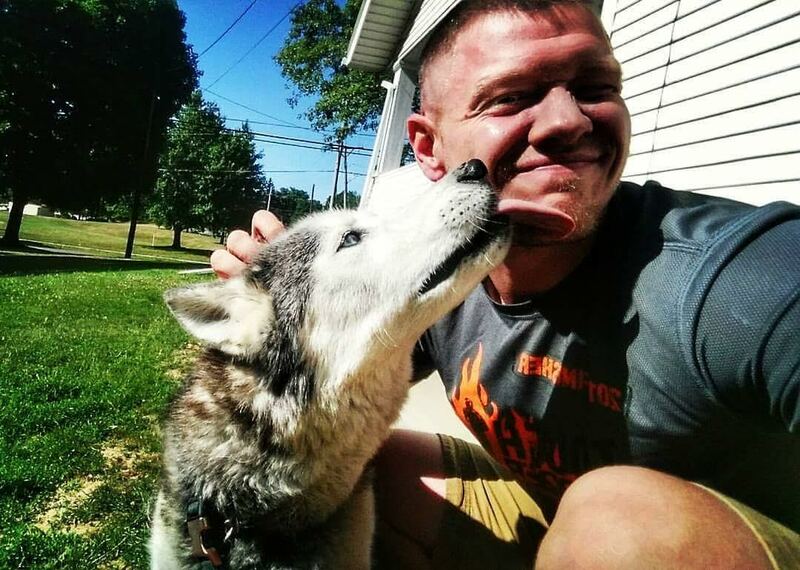 In the early part of 2015, I went through a divorce and spent most of the year very depressed. Through that I was told by my doctor and therapist that I most likely have chronic depression. I didn’t go through the tests to find out for sure because the last thing I wanted at that time was to be told by one more person that I have chronic depression. As a male, it’s hard to admit that we have depression or we just play it off. In May 2016, I broke the fifth metatarsal in my left foot. How did I break it? Sliding down from the top of Pyramid Scheme (hence the reason is it my least favorite obstacle). I didn’t realize it was broken right away and walked on it for two weeks before having a doctor look at it. After having an x-ray and seeing a nice clean break in the bone, I spent the next 6 weeks in a boot. In total, I lost 8 weeks of training thanks to that little tiny broken bone. Currently, I am working hard to get my cardiovascular endurance back to where it was prior to the break. Towards the end of 2015, maybe August or September, I began hating everything that I once loved. I no longer wanted to get out of bed in the mornings to work out or go to my volleyball or bowling leagues. All I wanted to do was stay in bed and not face reality. When it comes to overcoming depression, what are your top-3 recommendations? 1. I can’t stress this enough: don’t be afraid to talk about it. There are so many more people out there that are suffering than you can imagine. Talk with your friends and family. Don’t shut them out. 2. Get out of the reality that you are living. Sign up for a race, or a competition, or a vacation that you have always wanted to go on. Even if it is a year away. Give your mind something else to focus on. 3. If it is severe, go talk to your doctor. Go talk to a therapist. There is nothing wrong with reaching out and getting help. I have no idea where I would be right now if I didn’t do that. Have you had any embarrassing moments from a race? My OCR journey began in 2011. 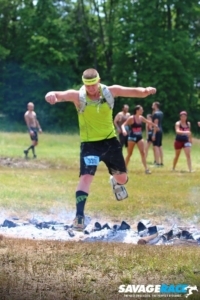 There were two Warrior Dashes in Ohio that year and I had signed up for both of them. 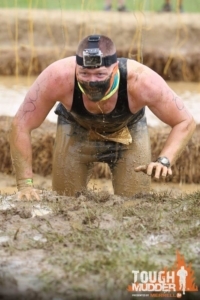 I was coming up to the finish line of the second race that year and there was a long muddy water pit right before the finish line. Have you ever experience the sensation of taking a step and realizing there wasn’t anything under your foot? Well, that’s what happened to me. I ran towards the muddy water and when I took my first step into the water, mid-stride, I realized it was deeper than I thought it was. As a result, I face planted into the mud right in front of at least 100 people who were standing around the finish line. Rookie mistake haha. What sports did you play growing up? What were some of your accomplishments? Growing up I playing nearly every organized sport in our area. The sports I excelled at were baseball, football, wrestling and bowling. In high school I was captain of the football and baseball team. I was voted the most valuable offensive player my senior year in football and I was voted the most valuable defensive player in baseball my senior year. Due to having some shoulder complications, I decided to play football at a DII school in college. I played for them a little over a year before I turned my focus to my school work. Tell me about a time when you experienced a lack of motivation. What caused this and what did you do about it? When I quit football in college I was extremely burnt out. I didn’t do anything active for about three months and had no desire to do anything. At that time, I weighed 247 pounds. There was no longer any reason to be that big since I wouldn’t be running people over as a fullback anymore. I wasn’t fat by any means but I got tired of looking at myself in the mirror and carrying that much weight. That feeling didn’t sit well with me and I just got back in the weight room and started running again. It took me about a year but I had lost 47 pounds. I have since put a little weight back on in the last 8 years but that was a great moment in my life when I got clear down to 200 pounds! Your job has you surrounded by athletic college kids, which are surprisingly considered the toughest demographic to register for OCR events. 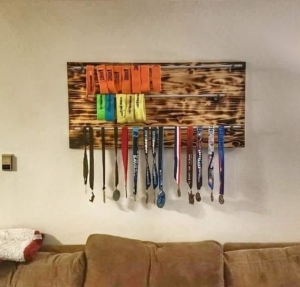 How would you make OCR more appealing to that age group? Of all the events you could have signed up for, what compelled you to sign up for World’s Toughest Mudder? 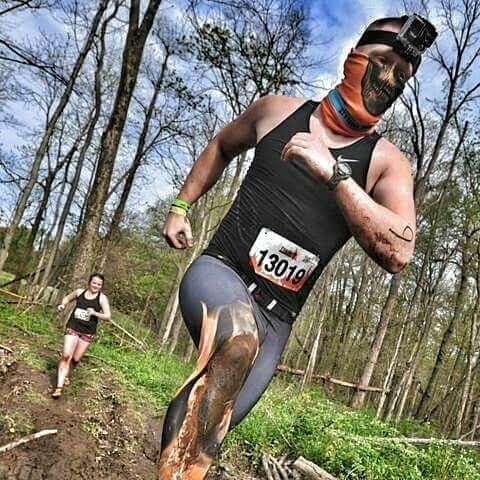 Signing up for the World’s Toughest Mudder was my escape from reality during my time of depression. I know there are other 24-hour events out there but I have always loved the Tough Mudder circuit. I watched all of the documentaries from the prior years, back to the first few years in New Jersey, and wanted to push myself to be as amazing as all of those unbelievable individuals that I saw competing in the WTM. So a little bit of it was my love for Tough Mudder, a little bit was me wanting to push myself to new limits, but most of it was to give me a focus to get out of the hole of depression I was in. I’m going to use the fifth time that I crossed that line. Warrior Dash consisted of my first four finishes and while they were fun and a great entry into the sport, they weren’t life changing. My fifth event was the Ohio Valley Tough Mudder in 2014. I still tell anyone who asks that this race was both the best and worst experiences of my life. It was hot and it was very hilly. I trained for the event but nowhere near what I should have. There was so many points in that race that I was having mental battles with myself about quitting, passing out, or finishing. Once I crossed that line I was hooked, I wanted more. All I could think about was how many racers out on the course were there to help everyone else finish no matter what, they wouldn’t let you quit. Describe your OCR training routine. Right now I am training for a marathon (my first) in October. I am putting in 40-50 miles a week and that will continue up until a few weeks prior to the WTM in November, when I will begin to taper. I weight train 3 days a week and try to do a race-inspired workout at least once a week. My favorite type of weight training is a focus on Olympic and powerlifting. I try to work those movements into my routine as much as I can. However, I put more of an emphasis on functional training such as using monkey bars, battling ropes, tires, etc. Almost every exercise that I do is for a specific targets specific muscle groups or weaknesses that relate to OCR obstacles. I also believe that there is nothing as good as going outside and doing some sort of activity. 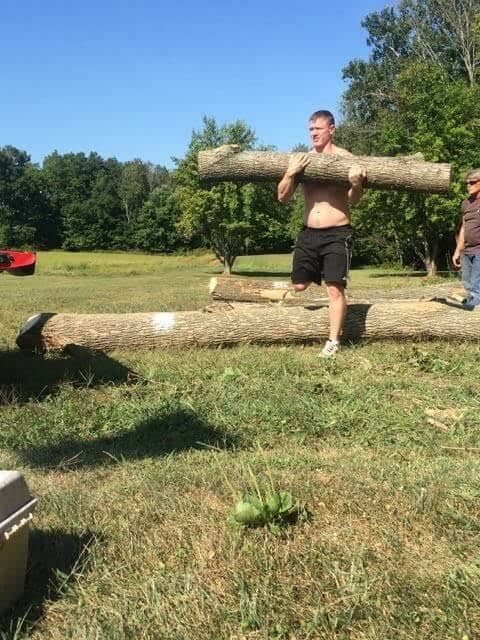 One of my favorite outdoor activities is cutting and splitting wood. It is such a great total body workout! I’ve heard you’re a decent bowler. I take it you’d never have to do burpees if there was a 10-pin bowling obstacle at races? Haha, that would be awesome! Talk about the ultimate equalizer for OCR obstacles! My father got me into bowling at a young age. He bowled in leagues 3 nights a week when I was little, so I basically grew up in the bowling alley. In most leagues that I bowl in now I still average between 210 and 215 a game. I have thrown five perfect games, with my first one being when I was 17. This is always a hard question for me to answer because I try to live life one day at a time and enjoy the present. I truly love working in Campus Recreation and I hope that in 10 years I can work my way up and become a Director at a facility. Somewhere preferably in the south and out of these horrible Ohio winters! I also hope that OCR has only grown and that I can still compete in these amazing events. It may not be in the capacity as I am now because I want to have a family. I want to continue pushing myself and be a dad that my kids can look up to and want to be active and live a healthy life. My biggest deadlift was 575 pounds while weighing 218 pounds. That’s where the hulk nickname comes from. How did you get into woodworking and what is your favorite project? My dad is very handy and I was typically his little helper on projects around the house when I was young. I was always very inspired by his remodeling projects. My grandpa was also very skilled at woodworking and I remember being very young making toy cars and other things out of wood with him. In 8th grade I took a woodshop class and fell in love with it and continued it into high school. It has really taken off over the last three years as I discovered how much of a stress relief it is for me. I don’t think about anything else when I am building something and that is an amazing feeling. 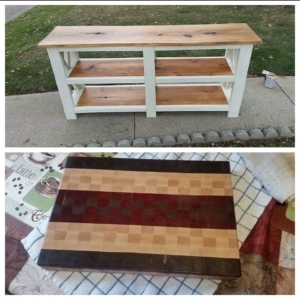 I have built a lot of my own furniture including my queen storage bed frame, coffee table, console table, wine rack, coat rack, cutting boards and many other things! It’s tough to say which one is my favorite but If I had to pick one it would be my console table. The top shelf is a 100+ year old solid piece of oak and the bottom two shelves are 90-year old oak floorboards that someone tore out of their attic and was going to throw them away. I took them and made them look beautiful again! I do have another IG for my woodworking projects and that is @woodworkinghulk. Check it out if you’d like to see a handful of my projects! As a whole, I think it is great for the sport. I think it’s awesome that I can now turn on the TV and see college teams compete in OCR. The only thing I dislike is that it may be a little off putting to someone who has never tried an OCR but has been considering it. This coverage shows elite races competing in very difficult events and I’ve already heard things from my students who have watched and said that they would never sign up for an event like that. Again, it just comes down to educating them. I am extremely excited that CBS has picked up coverage for this year’s World’s Toughest Mudder and next year’s new Toughest Mudder events. Not only is this going to show how difficult this event is, it is also going to follow some athletes along in their training. I think this will help viewers relate to the athletes a little better and see how much sacrifice it takes to train for these ultra-endurance events. Which athlete from the big-four sports (football, baseball, basketball, and hockey) do you think would do best if they switched to OCR? Wow, that’s a tough question. I feel like this topic could go on forever! I’m going to take the easy way out and be a little biased here. I am a huge Cleveland sports fan and now that we have ended our 52-year championship drought, I’m going to pick a Cleveland player. 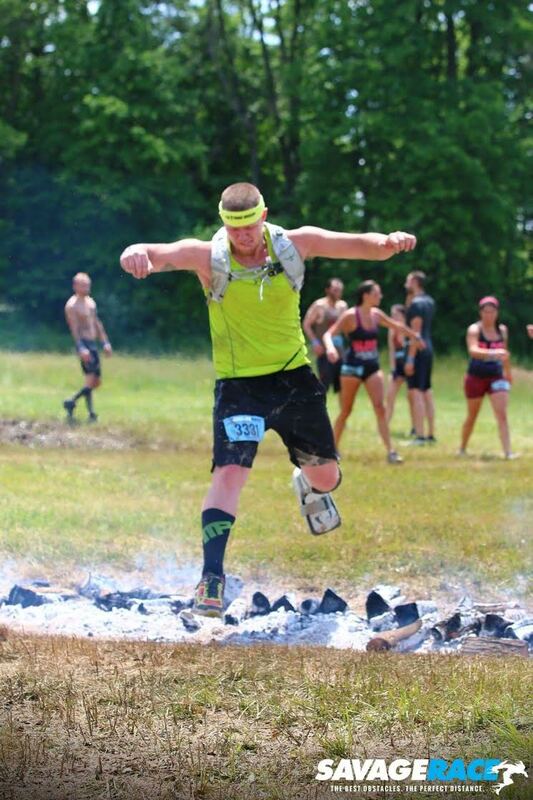 I think it would be awesome to see Kyrie Irving out at an OCR. Both his speed and agility are non-human. The main achievements that I am chasing this year are finishing my first full marathon and completing 50 miles at the World’s Toughest Mudder. It wasn’t my initial intention but I am running in at least one of the big brands this year. Another achievement I hope to reach is 5 laps at the Cleveland Battlefrog BFX. In 2017, I’m going to focus on getting my first two Trifecta medals. I have 17 medals and 13 headbands. 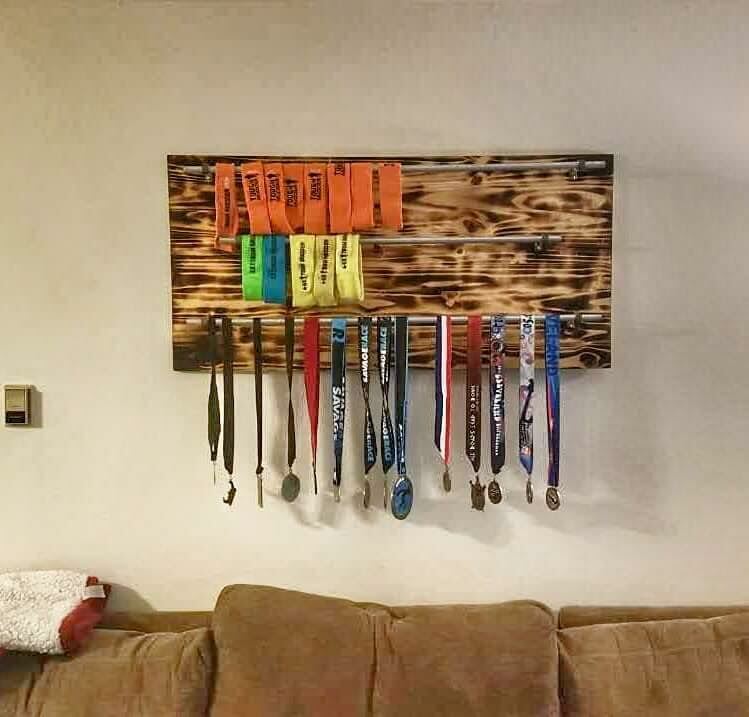 You can probably guess by this point, but I made my own headband and medal hanger that is prominently on display in my living room! The medal I am most proud of is the Savage Syndicate medal that I earned this year. Not because it is arguably the most badass medal in all of OCR, but what I went through to earn it. Both the Ohio and Pennsylvania Savage race occurred while I was in my walking boot. I had already signed up for both of them months prior to breaking my foot because of how badly I wanted to earn that massive spinning medal. I wasn’t going to let a broken foot get me down. I walked both courses in my walking boot and completed nearly every obstacle they had. The only ones I went around would the mud obstacles. Was it the best idea? Probably not, but that’s what happens when you are addicted to OCR! I have discussed several of my huge passions already. Outside of those, I love helping people when it comes to fitness. Working in a college recreation setting really gives me the opportunity to do this. A lot of my student employees are always asking me about exercises and workouts that they can do to improve certain aspects of their fitness. It is an amazing feeling when I see them take my advice and improve their squat or improve their deadlift over time. I could honestly talk fitness and working out all day long if I had the opportunity to do so! If I got to design a course, I would probably have a lot of people not happy with me (I mean that in a good way). When I used to teach group fitness classes, I would always design my workouts to push people further than they thought they could go, to find their breaking point and then smash through it. That is the same mentality that I would take into a course design. The location would have to be not only woodsy but also very hilly. Who doesn’t love hills? The distance would be somewhere between 8-10 miles. My favorite type of obstacles are those that induce a little bit of fear and help people to overcome their fears. A lot of water, a lot of heights, and a whole lot of grip strength. I do believe that a lot of the brands have the pre and post-race festivals down! They all pretty much have the same concept but all do it in their own unique way. I love the live music, almost a festival type vibe. It’s something that helps participants to not think about what they are about to do or enjoy a cold beer and reflect on the race with their friends and family. Another thing that is a must are the festival-only obstacles, like how the Tough Mudder has the salmon ladder and other various competitions that participants can compete in!